New Main Library, 100 Larkin Street. 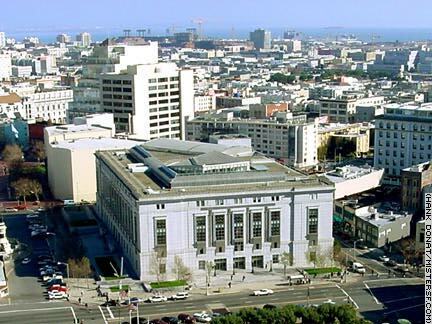 In 1996 San Francisco inaugurated its $30 million New Main Library with an elaborate Civic Center ceremony. In a spectacle where Mayor Willie Brown took center stage, a skydiver came from the blue on cue to present the mayor with a ceremonial key to the new building. The pageant also included construction workers who built the facility, local school children, library donors, and others. Topping the whole thing off was Beach Blanket Babylon's Val Diamond with the New Main Library added to the City landmarks on her famous hat. Soon after the "New Main" was dedicated, City officials revealed that the building actually holds fewer books than the old Main Library a few yards away. Increased shelf space and other improvements would cost another $30 million. What the new building lacks in stacks it makes up for in the abundance of natural light that comes from its 5-story skylight and many windows. Native American activists condemn one of the statues outside the library's north entrance. They say the statue, which clearly depicts a missionary and a settler subjugating a Native American, is racist. You may judge for yourself.